Dot Diddlers, Inc. was formed during the 92 reunion to assure those participants who just had a green dot on their name tag ... and no photograph ... that they were important. This group would question individuals about their occupation and hobbies and then draw an appropriate picture on their name tag, the green dot being the commonality. 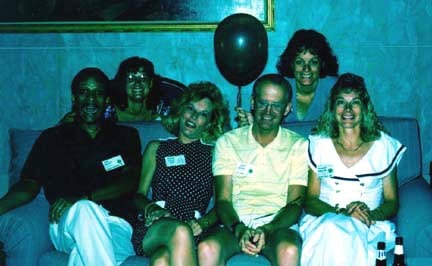 The balloon signified the location of corporate headquarters during the Saturday evening dance so Dot Diddlers, Inc. could easily be identified and "perform their duties." By the end of the reunion, "The Dots" insisted on a class photograph. Seated: John, unknown, Scott Doyle, unknown.